"It is not surprising, therefore, to learn that the latest fad to be introduced by this class of riders, is the "bicycle breakfast," which has become exceedingly popular of late. These have been indulged in to the greatest extent at the numerous watering places and Summer resorts... The meet is usually arranged to take place early on Saturday morning, thus allowing the gentlemen of the party who have run down ... to spend Saturday and Sunday, to participate. The time for the meeting is usually from seven to eight o'clock. Before starting, the riders partake of coffee or chocolate, and perhaps a sandwich, after which they start off for a two hours' spin, and return to find a dainty but substantial breakfast awaiting them. 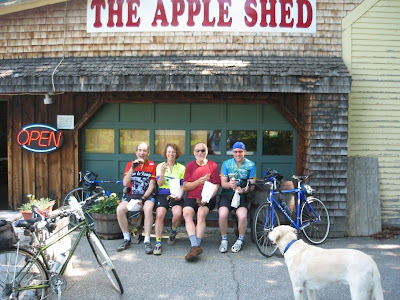 Whether it is the ride itself, the pleasure of companionship, the breakfast, or all three combined, certain it is that bicycle breakfasts have, during the past Summer, become an exceedingly popular institution at nearly all of the eastern Summer resorts." A number of our club members have suggested that we consider establishing a regular "breakfast ride" where we can get together, ride, and yes - eat. As a number of us have joined the ranks of the formerly-employed and many of the rest of us are coasting in that direction, it would seem to be a good idea to bring up right about now. As it happens, I have Monday and Friday mornings free during the week, at least for the foreseeable future. What are good days for the rest of you? What ride locations would be convenient? More importantly, what breakfast haunts would be the most enticing? Where can we find breakfast - "dainty but substantial" - worth riding to? Give me your suggestions, either in the comments below or at hjmerrick@gmail.com, and I'll work on the replies. So "whether it is the ride itself, the pleasure of companionship, the breakfast, or all three combined," let me know, and I'll see what can be arranged. Remember: Life is Short - Breakfast is Waiting. Ride to eat sounds great! !